How to add Twitter content to my social wall? To add Twitter hashtags, profiles, collections or lists as sources to your social wall, you first need to connect your Twitter account to Walls.io. To do that just go to Settings > Sources in your Walls.io dashboard, select Twitter and click connect. 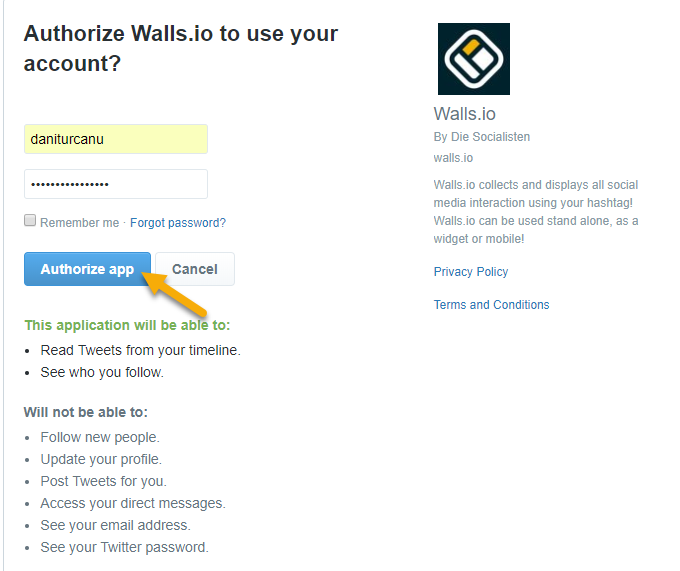 You will be prompted to login and authorize Walls.io. Click "Authorize app" to complete the connection process. This is something you will only need to set up once. 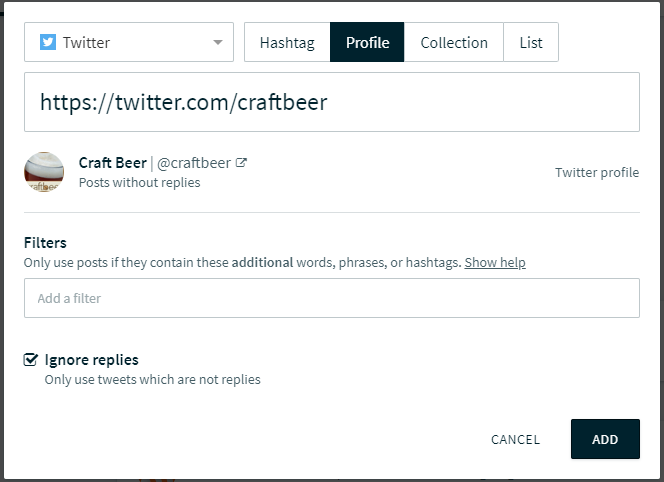 To add a Twitter hashtag as a source to your social wall go to Settings > Sources in your Walls.io dashboard and select Twitter > Hashtag. 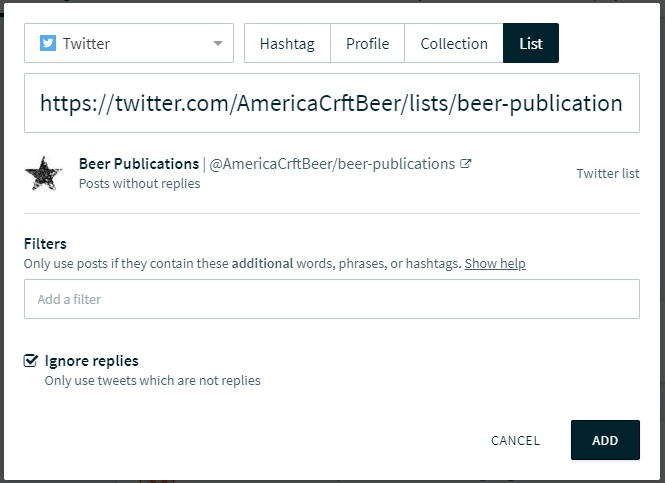 Then simply add the hashtag whose content you would like to pull and click "ADD". 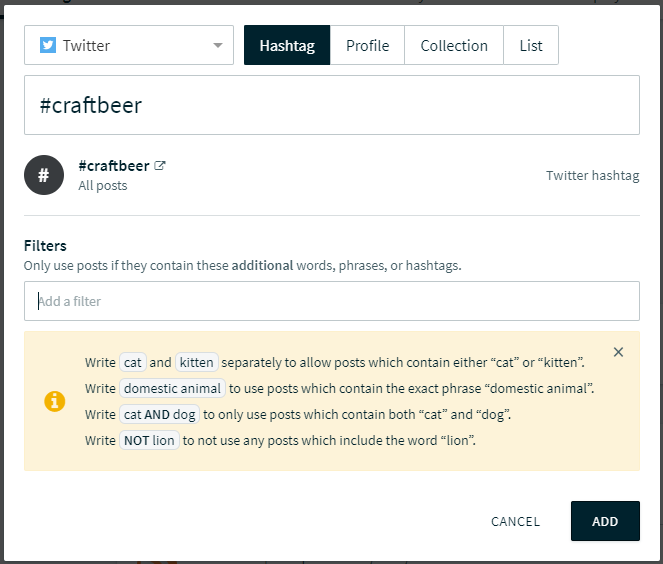 You can also add content filters if you want to refine the content. To add a Twitter profile as a source to your social wall go to Settings > Sources in your Walls.io dashboard and select Twitter > Profile. Then simply add the profile URL you would like to add as a source and click "ADD". You can also use different filters to refine the profile content that gets posted on your wall. You can also choose to ignore replies. 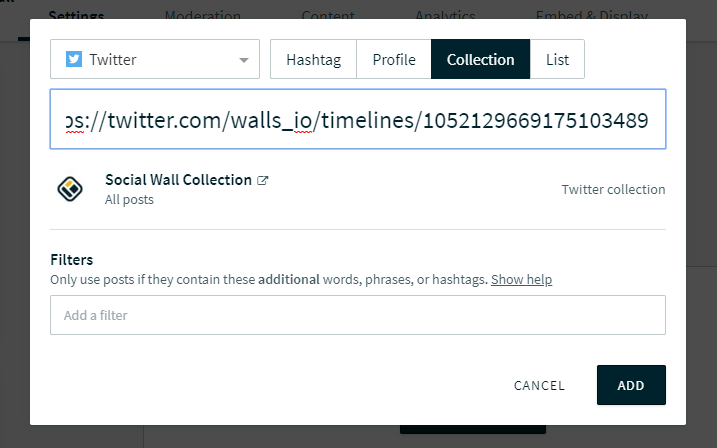 To add a Twitter collection as a source to your social wall go to Settings > Sources in your Walls.io dashboard and select Twitter > Collection. Then simply add the Twitter Collection URL that you would like to add as a source and click "ADD". You don't have a Twitter collection? It's very easy to create one. Here's a tutorial on how you can do it. To add a Twitter list as a source to your social wall go to Settings > Sources in your Walls.io dashboard and select Twitter > List. Then simply add the list URL that you would like to add as a source and click "ADD". Just like for profiles, you can choose to ignore replies for the tweets in your list. You don't have a Twitter list? It's very easy to create one. Here's a tutorial on how you can do it.